American college student Isabel’s parents have offered her a trip anywhere in the world for her 21st birthday. They are deeply concerned, however, when she chooses to go to Chile. Isabel’s mother, Connie, was a student activist who fled Pinochet’s rule, and she fears for her daughter’s safety. But Isabel prevails and sets off with her friend and roommate, Sandy. Unfortunately, it turns out Connie was right to worry. A cabal of military officers still loyal to Pinochet continues to exert its influence, with the help of an Italian mob boss who has his own ambitions. When they learn of Isabel’s presence in the country and her connection to Connie, the officers fear she will expose their corrupt endeavors. A sinister colonel orders her and Sandy kidnapped. He and his followers, however, do not count on the involvement of Isabel’s half-brother, Calixto, a Special Forces soldier. Calixto sets off to rescue his sister, using his formidable talents and network of contacts. The novel follows not only Isabel, Calixto and Pinochet’s men, but an ailing, mysterious man, who relates the story of Operation Condor, a campaign of political repression in some Latin American countries in the ‘70s and ‘80s; Pasquale Bellocco, the Pinochet holdovers’ link to the world of organized crime; and a tango dancer caught in Pasquale’s orbit, among others. Multiple points of view can be a liability, but Dimodica balances all these plot strands with aplomb, giving equal urgency and depth to each. The novel’s pacing is also pitch-perfect, with short, punchy chapters that balance action and intrigue. Dimodica’s characters, too, are well-wrought and nicely developed, earning readers’ sympathy or revulsion. Despite the intensity of the story’s pace and plot, their actions never stray too far from the realm of believability. 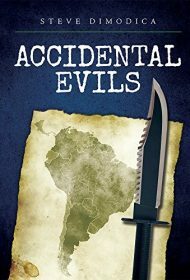 Overall, Accidental Evils is an engrossing read that should enthrall fans of action-packed and intelligent suspense.